No system requirements. 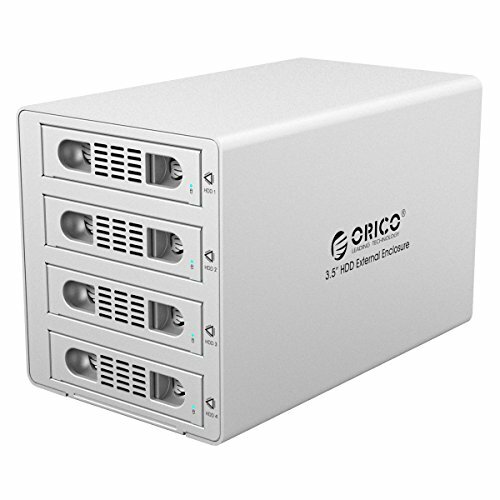 ORICO hard drive enclosure supports most of systems, such as Windows 2000, XP, Windows Vista, Windows 7/10, Mac OS X 10.2 or above. Notice: Hard Drive in Pictures is for Reference Only and not included. Aluminum Alloy design, support RAID modes: RAID 0/1 /3/5/10/combine/clear RAID. Support all brand of 3.5" SATA I / II / III hard drive up to 8TB per drive, and support SATA III 6.0Gbps speed, Support UASP for faster transfer rate. Tool free installation, LED indicator for power and HDD access, support hot-swap. What is in the box: 1 x ORICO USB3.0 RAID Hard Drive Enclosure; 1 x 150W Power Adapter; 1 x 3.3Ft. USB3.0 Cable; 1 x eSATA Data Cable; 1 x User Manual; 1 x Service Card; we provide 18 Months warranty and lifetime technical support for purchase via ORICO.